Award-winning cookbook author Lee Clayton Roper presents Fresh Tastes, the follow-up to her critically acclaimed A Well-Seasoned Kitchen. Lee has gathered a unique collection of recipes that showcase how fresh ingredients and new ideas can be combined to deliver extraordinarily flavorful dishes guaranteed to please all palates. Fans of A Well-Seasoned Kitchen will recall that Lee s first cookbook was inspired by her mother Sally Clayton s love of cooking and entertaining. 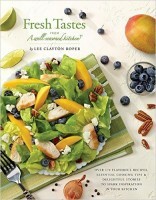 Her second volume, Fresh Tastes, was born from creating dishes with a new and fresh perspective. These 173 recipes are a combination of her own spin on dishes shared with her by friends and family as well as flavorful creations direct from her own kitchen. Lee takes the complicated out of timeless classics, simplifying the process while ramping up flavors, using fresh ingredients when and where possible. She shares personal reflections on lessons she has learned in the kitchen from those who have inspired her, along with 65 beautiful color photographs of the finished dishes and 18 process shots of key preparation steps (such as peeling a butternut squash or putting a foil collar on a soufflé dish). Indispensable cooking tips are included throughout, as are serving suggestions and a helpful menu section. From updated classics to new, contemporary fare, each recipe was chosen for its flavor, reliability, accessible ingredients, ease of preparation and sophisticated presentation. Fresh Tastes inspires readers to create fresh, delicious dishes for weekday meals or formal entertaining, empowering creativity in the kitchen everyday.